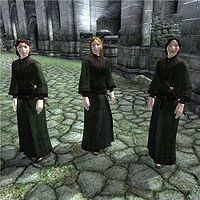 Mage Apprentices are NPCs found in the Arcane University of the Imperial City. Interactions with Apprentices are limited until the conclusion of the Mages Guild questline, Confront the King, at which point they become available as followers. You may only have one Mage Apprentice following you at any given time. 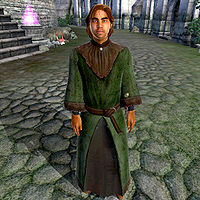 All Mage Apprentices wear a Robe of the Apprentice and a pair of russet felt shoes, as well as carrying a copy of the standard text Manual of Spellcraft. In combat, they wield an iron dagger and a second, enchanted, dagger of the best possible quality for your level. In addition, all Mage Apprentices will know how to cast 3 Destruction spells (2 weak, 1 powerful), 2 weak Summon spells, 1 powerful Restoration spell and 1 powerful Illusion spell. All Apprentices have different schedules and will be found performing different activities during the course of the day: from casting spells to taking a stroll of the campus, to mixing up potions to reading about the arcane secrets of magic. Breton apprentices will sleep from midnight to 6am, while Imperials are sort of night-owls and prefer to sleep from 6pm until midnight. All apprentices have one activity in common: lectures. A little, open-air classroom is set in front of the Praxographical Center, with rows of benches and a reading pulpit. From here a Mage Scholar will instruct the novices on the topic of Doomstones and Runestones. There are two classes: a morning one from 9am to midday and an afternoon one from 3pm to 6pm. A given Apprentice will only attend one of them. Although there are technically ten different Mage Apprentices in the construction set, the statistics of each are entirely dependent on their race. An Apprentice will be either a Breton or an Imperial, and each race is given their own set of stats. The differences between the two races are Attribute values and base Health and Magicka. All Breton Apprentices are female; similarly, all Imperial Apprentices are male. The Breton Apprentices are more "magically capable" than their Imperial counterparts, as they have higher Magicka, as well as higher Intelligence and Willpower values. On the other hand, their health is 10 points lower. Imperial Apprentices are inferior to their Breton colleagues in magical statistics, since they have less magicka and lesser values in Intelligence and Willpower. However, their health is 10 points higher at all levels. "Follow me. ": The Mage Apprentice will follow you, attack what is hostile towards you, and engage in random conversation with other NPCs (if given the opportunity). "Wait here. ": The Mage Apprentice will remain in the specified spot. The apprentice will not wander or engage in conversation with others, but will move to attack hostile creatures or NPCs that come within range. "Return to your studies. ": The Mage Apprentice will return to the Arcane University. This page was last modified on 11 January 2018, at 05:34.